Maddie Rooney started playing hockey when she was five and switched to being a goalie during her second year of Squirts after finally convincing her dad to let her put the pads on. 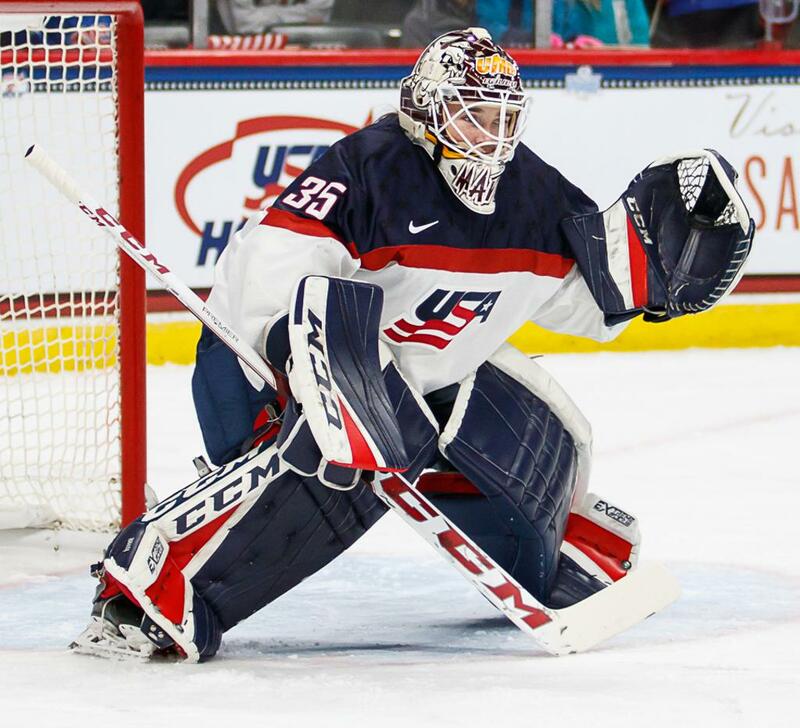 For the first time since 1998, when women’s hockey became an Olympic sport, there’s a goalie from Minnesota on Team USA. Her name is Maddie Rooney who grew up playing hockey in Andover. She was officially named to the U.S. Olympic team on Jan. 1. At 20 years old, Rooney is the youngest player on the U.S. roster. “I always watched the Olympics growing up and I always had a dream to play on this team,” said Rooney. Even though she participated in several USA Hockey Development Camps and was on the U.S. National team in 2017, Rooney didn’t think she would have an opportunity to play in the Olympics until after she finished her career at the University of Minnesota Duluth. And a few short months later, she was one of three goalies selected to represent the U.S. at the 2018 PyeongChang Winter Olympic Games. And she can hardly wait. Her teammates who have competed in previous Winter Games are helping her get a sense of what the experience of playing on the Olympic stage will be all about. “Having those conversations and hearing all their excitement has really got me excited,” Rooney said. Team USA plays their first game in the preliminary round of the Olympics on Sunday, Feb. 11 against Finland, after that they take on the Olympic Athletes from Russia, Feb. 13; and Canada Feb. 15. Then it’s on to the quarterfinals, and then perhaps, a much anticipated medal round showdown with Canada. Rooney started playing hockey when she was five and switched to being a goalie during her second year of Squirts after finally convincing her dad to let her put the pads on. After making the switch to full-time goalie, Rooney played boys hockey through bantams. She then joined the Andover High School girls’ team for two seasons where she led her team to its first state tournament appearance. Rooney decided to finish her prep career with the Huskies boys’ team. And it was also one last chance to be on a team with the guys she played with during her youth hockey days. And she continues to improve her game by working hard every day in practice to become a better goaltender. And you know Rooney will be ready to go when the puck drops at the Olympic Games.